Okay, the trail itself is pretty simple, but getting to the trailhead itself is somewhat of an adventure. But more on that below. First, the trail: The trail starts at a sandy beach at river mile nine (above Lee's Ferry) at the bottom of senic Glen Canyon. Tamarisks dot the shore, but its easy to spot the steps and the break in the trees. There are two pit toilets on the north side of the trail just above the beach. It is a fairly easy, mostly level graveled trail that leads from the riverbank up onto an old alluvial bench, along the orange-brown cliff to a series of petroglyphs. There is a wide viewing area that showcases a number of different designs. There are Archaic bighorn sheep, Pueblo III figures (including possibly a bird), and something that even resembles a Mimbres pottery design. There are a couple of interperative signs at the site detailing some of the information that archeologists have wrung out of these (and other) etchings on the rocks. From the viewing area, there is a nice view of the Colorado River and the plug that makes up the central part of Horseshoe Bend. 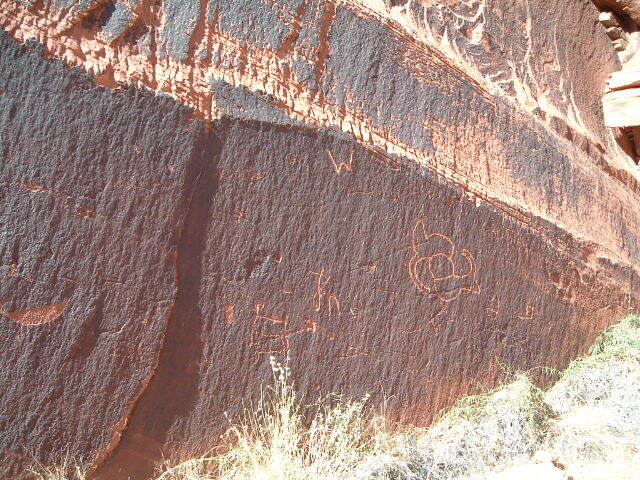 After taking in the beauty of the canyon and the petroglyphs, its an easy stroll back to your waiting boat. That's right, boat. The trailhead is only accesible via boat on the Colorado River, and there are basically three ways to get there. The first is the upstream method. This requires taking a shallow-draft boat from the Lee's Ferry boat launch site nine miles upriver to the trailhead. All of Glen Canyon is managed by the Glen Canyon National Recreation Area, which costs to enter (good for seven days). In addition to that, there is also a boat fee charged at the entrance station (only valid on powered boats). 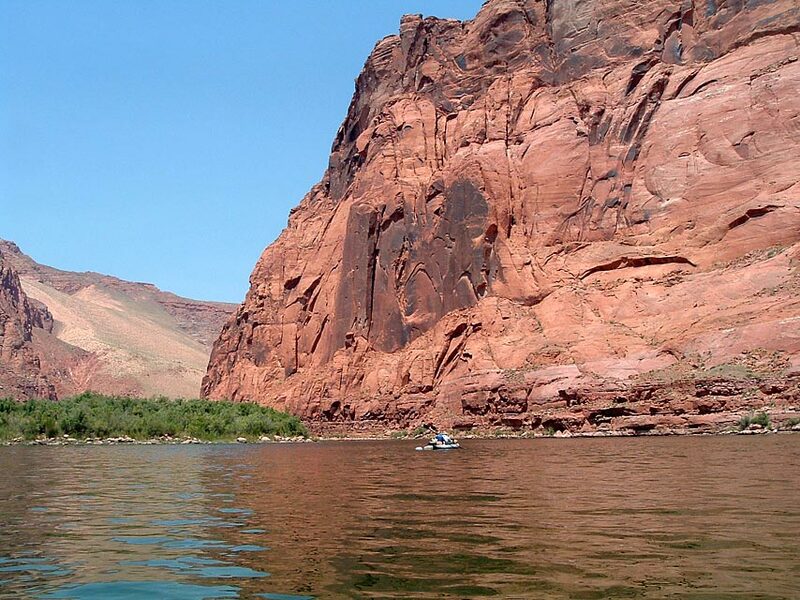 If you don't have a boat, there are places near Lee's Ferry (at Marble Canyon, Vermillion Cliffs, and Cliff Dwellers), as well as at Page that offer boat rentals and guide services. The second method is the downstream method. This requires signing on to a tour in Page for a smoothwater float trip. 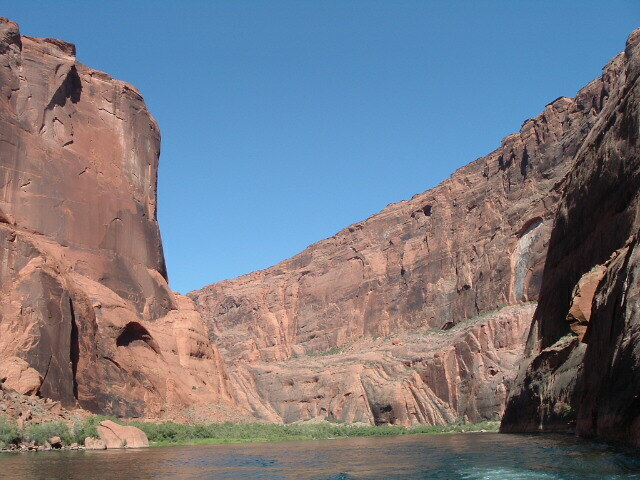 The group is bussed through a tunnel to the base of Glen Canyon Dam, and taken on a guided float trip through Glen Canyon down to Lee's Ferry. 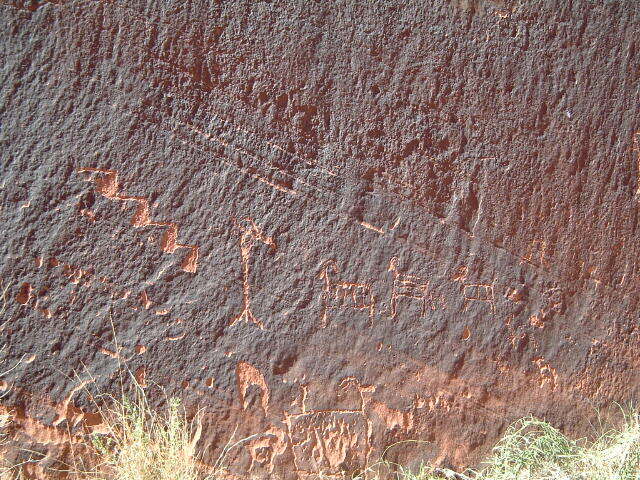 This trip includes a stop at the petroglyphs. This is a little costly, but since you're bussed back to Page at the end of the trip, it is pretty convenient if you've only got half a day. The final method is the up-down method, which requires taking a raft, kayak, or canoe, and having it towed to river mile nine (or futher upstream if you wish), and gently floating back downstream at your own pace. The float service, Wilderness River Adventures, drives its rafts back to the dam after each trip, so it is possible to catch a tow back up with them for a fee (about $20!). Some fishing groups may be willing to tak you up as well, if you catch them at the launch site. The upside to this method is that it is completely at your own pace. You can take as long as you want to float back downstream, spending several days along the river. The downside is that if you miss the beach and go further downriver, its hard to go back, whereas a guided service or float trip will take you directly to the site without error. A note on camping in Glen Canyon: Below I've listed backpacking as possible, but I don't mean that in the traditional sense. Camping is allowed along the river, only in designated camp sites. There are pit toliets and fire pits at the campsites - if the site doesn't have those attributes, its not a legal campground. The water in the Colorado is drinkable with treatment, but is very very cold. Even in the summer, spending too long in the river can result in hypothermia, so very aware. As always, pack it in, pack it out. 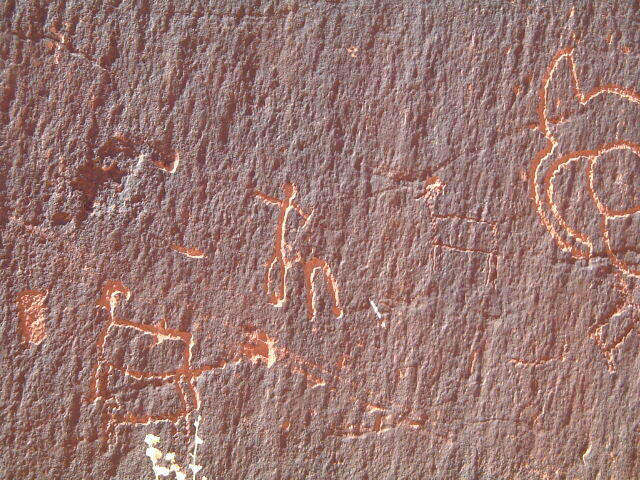 There is no road to the Horseshoe Bend Petroglyphs -the only access is via the Colorado River. To get to Lee's Ferry from Flagstaff, take US89 north to Bitter Springs. There is a sign for US89A to the left. Turn there, and follow 89A over Navajo Bridge at Marble Canyon. Just beyond the bridge, before getting to Marble Canyon Trading Post, is a right turn, signed for Lee's Ferry. Turn there and follow the road down to the Lee's Ferry boat ramp. There is a self-pay site along the entrance road. To get to Page from Flagstaff, follow US89 north. After apx. 130 miles, take the first signed entrance to Page (Lake Powell Boulevard) at the Maverik gas station. This will lead to the top of the mesa, where float trips, river guides, and kayak rentals can be found.